The Power of "Layer Color"
Painting digitally is powerful and versatile, but that often comes at the cost of clutter. Compared to working with traditional media, the Photoshop user interface is a bit overwhelming. In today's blog post, we'll explore one way to keep your interface under control: color coded layers. In addition to naming your layers, Photoshop allows you to assign them a color in the layer palette. If you've ever used a 3-ring binder with color coded tabs, this system will seem quite familiar. At a glance, I can quickly scan my layer palette and learn some valuable info. Even though I haven't named any of the layers, each color has significance for my process. Orange layers, for instance, are always line-art. Red layers? They're saved selections (see this video to learn more about how I like to use these.) Your process is different than mine, so your colors might have different meanings - but the end result is still efficient workflow. Many Photoshop pros, such as the fine folks at Photoshop Etiquette, encourage you to name your layers. This might be a good rule for team-based graphic design work, but digital painters use layers a bit differently. I commonly make (and then flatten) a new layer every 10 seconds. 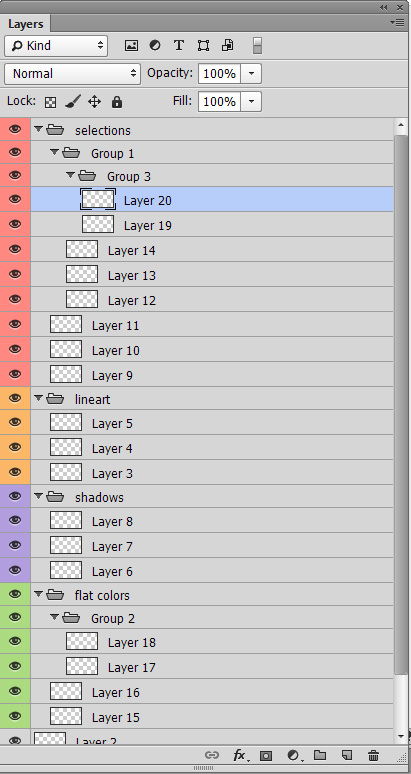 Naming layers, for me, would be an impractical nightmare. Color coding them is quick, and conveys a fair amount of information. Especially since I'll be merging them into the stack, specific names are not essential. To speed up my process even further, I take advantage of layer groups. Layers adopt the color of their group - meaning I rarely need to assign my color-coding manually. Once I've created a group for my line-art layers and set its color to orange, any new layer in that group will automatically be orange. This rule applies for both new layers and old layers moved into color coded groups. In practical terms, this means that I set up color coded groups at the start of a painting, and the color coding is essentially automatic after that. How will you color code? There's no rule that says line-art needs to be orange. Some of my color choices have significance; shadows, for instance, are purple. My selection layers are almost always hidden, so I like to make them red in order to be eye-catching. Orange line-art is totally arbitrary - the only important part is that I remember. With this in mind, I encourage you to start designing your own color coding layer scheme. You can start small, potentially one or two colors. The goal is to simplify your process, not add extra steps - so don't go crazy with this. Once you've given it a try, we'd love to hear about it in the comments!